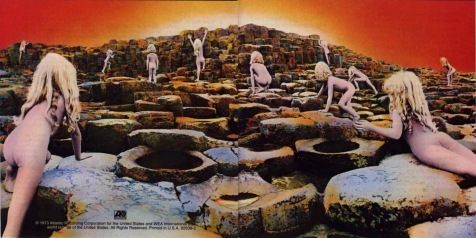 I have just listened to Stefan Gates’ Cover Story, Radio 4, on the BBC iPlayer (http://bit.ly/9GpSwG) , who was one of the children photographed for the Led Zeppelin album Houses of the Holy. In it he talks about the experience and the way it has, in no small way, affected his life. Strangely enough he had never listened to the album until he did this piece and I’m glad to say that revisting the location of the shoot and finally hearing the album was a cleansing experience for him. This was my first Led Zeppelin album. My mother, who worked in a department store (Chadds of Hereford) brought it home for me after one of the guys from the record department suggested that I might like it. I was about 13 at the time and have been an ardent Led Zeppelin fan ever since (thanks Mum). This entry was posted in Husband, Father, Dog Walker, The Rest and tagged BBC, Houses of the Holy, Led Zeppelin, music, Radio 4, Stefan Gates by RedEyedMonster. Bookmark the permalink. I didn’t hear the start of the interview first time round but Nic was describing it to me because of the Giants Causeway connection. She couldn’t remember what the album was but I guessed immediately. I was more a Floyd fan than Led Zep, never really got past Led Zep 1, but I had friends who thought Houses was the ultimate musical experience.